Within Permaculture we see nature as our ultimate teacher. She will demonstrate how species interact with each other and their surroundings and which effects you can expect from it. She will also demonstrate the response of the web of life to different (or changing) circumstances. Just observing, even with our rather limited knowledge of exactly how it all works, demonstrates which approaches we can choose to improve the conditions of our ecosystems. We had an unprecedented opportunity in 2015/2016 to observe the effects of the greatest drought in decades in our area caused by the El Niño phenomenon. During 16 months we only had a minimal amount of short rain showers and blistering sun most of the time. Our dams dried out in December 2015 so irrigation was no longer possible and we were forced to let nature deal with the remaining months of drought by herself. Visions of dying plants and trees dominated our expectations, possibly leading to a totally ruined farm. Let’s not even go into the fire risk this was creating. Then nature gave us a pleasant surprise! Some plants did die of course, but some were barely affected, others just stopped growing and waited for the rains to return and nature gave us a clear demonstration of which circumstances influence survival for the better or worse. 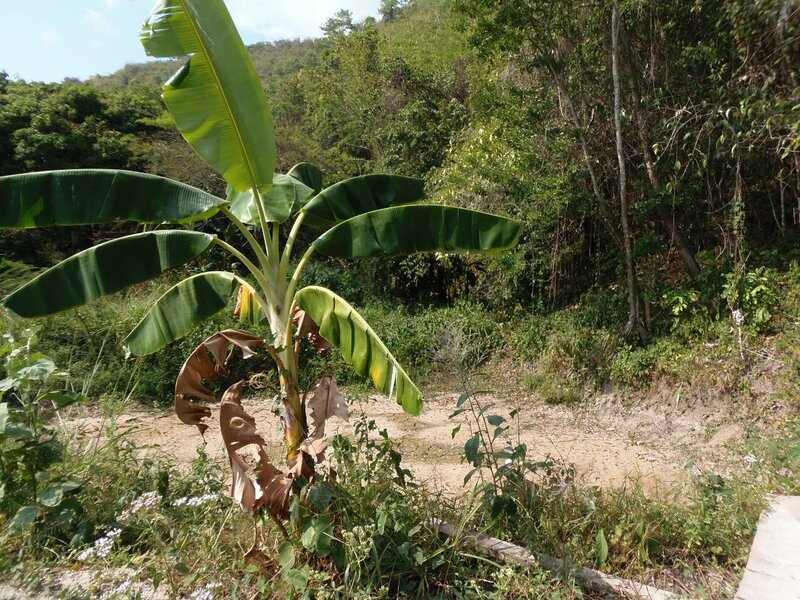 The same banana plant, first picture from December 2015 in the middle of the drought, dam in the background is dry. 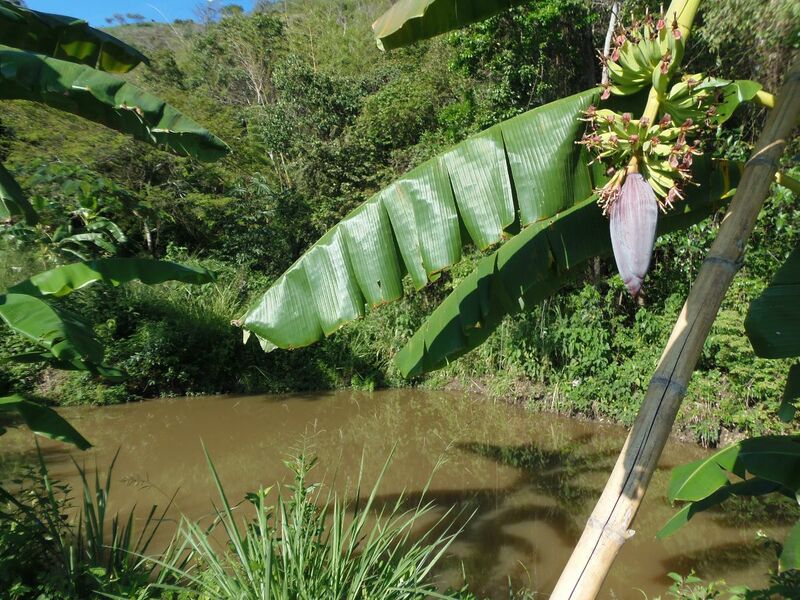 Second picture from October 2016, the banana is now flowering, rains are slowly coming back, the dam is starting to fill up again. Some of the early changes we made to the land paid of big time. 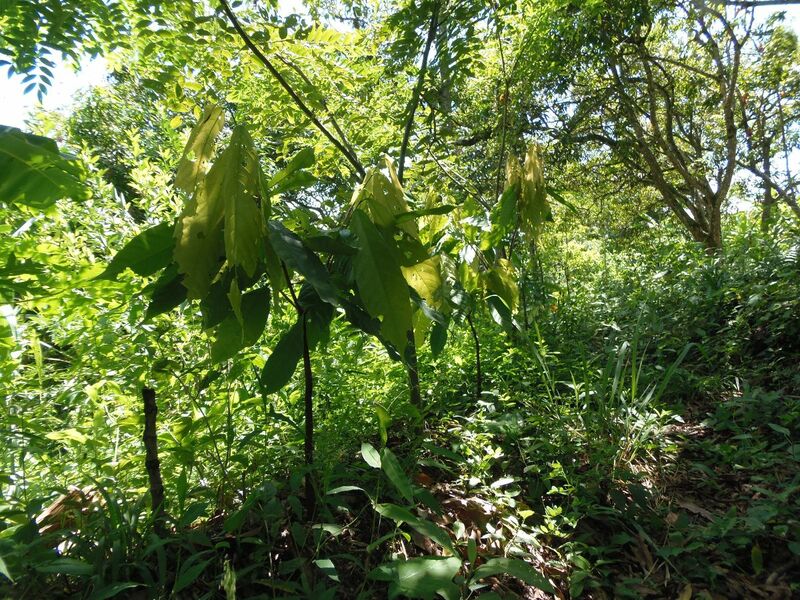 In those areas plant life actually thrived despite the drought. These were the places that were made flat, the soil made loose, compost added, they were irrigated the longest (until almost halfway through the drought) and were dense with vegetation. 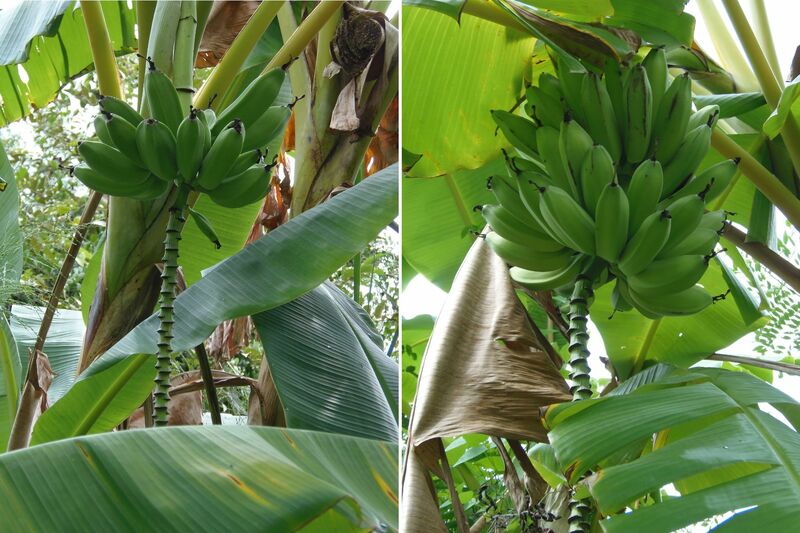 The bananas growing in this area during the dry months produced big time despite the lack of rain! 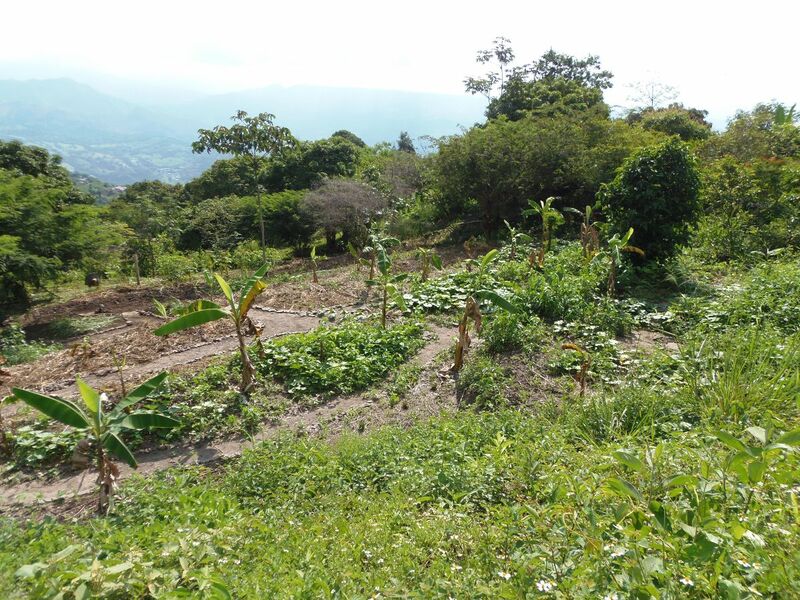 Fruit from different locations, left from unaltered slopes, compacted soil, right side from an area made flat, loose and shaded/covered soil. These plants flowered during the last months of the drought. Now we had to turn our months long observations into the best actions possible. Our aim is to kickstart nature to thrive without much further help after that. We could now identify what nature likes best, so our main task is to give her that. 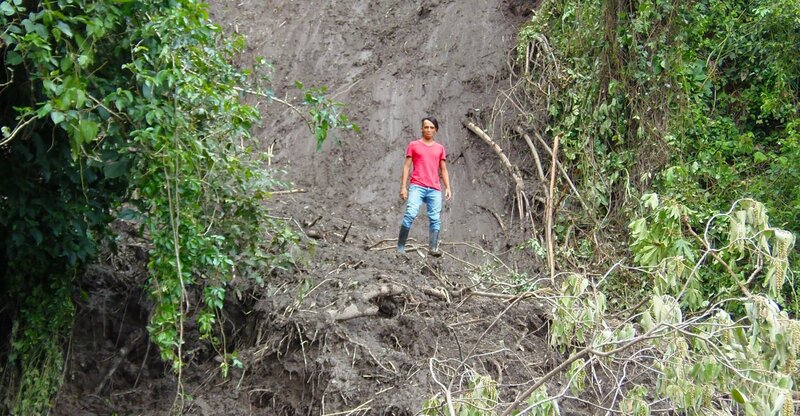 None of the desired circumstances was a surprise: flat land for minimal erosion and maximum water infiltration, lots of organic material on the ground, a bit of compost, dense plant cover, it’s all obvious. What the real surprise was, was that nature can totally handle extreme droughts and still thrive if she gets these circumstances and some time to establish. Nature demonstrated that even in this harsh wet-dry climate we can probably create an ecosystem that does not even need irrigation to survive and produce. If that were to work out, that would be the real stunner. 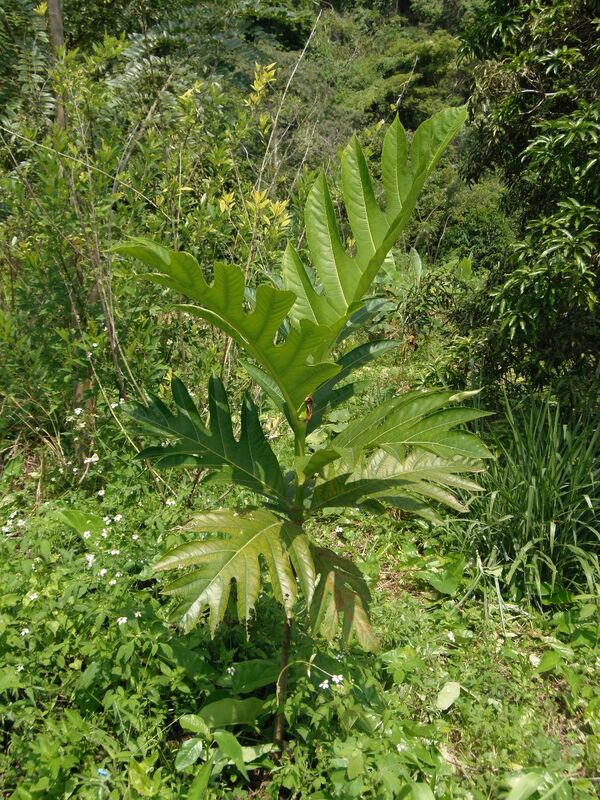 Cacao, 2 years old, growing on swales, shaded out, survived the drought. So we changed the design for the land once again. Instead of only digging swales we’re now terracing our entire zones one and two. It’s a tremendous amount of work that only progresses slowly, but nature has us convinced now it’s worth the effort. If we were humble enough before we could have realized it even without this experience, after all, so many ancient peoples already terraced their slopes centuries ago, you would think they had good reasons to do so. As Mollison said, there’s not so much new in Permaculture, the value lies mainly in putting all this knowledge together into one system of design. 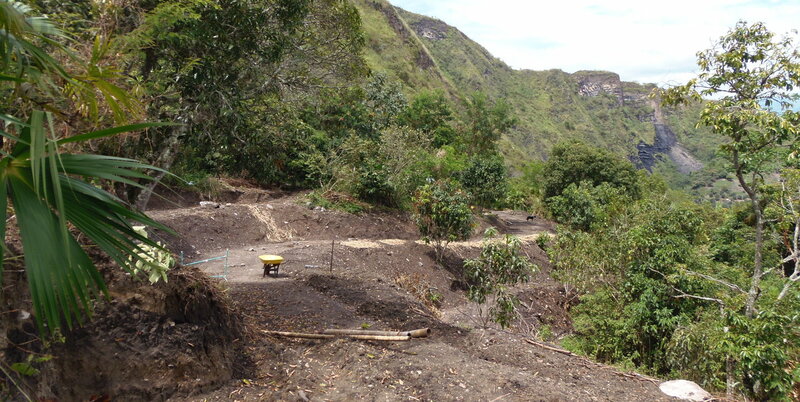 Terraces being dug into the slopes. The higher terraces were seeded about a month before this picture was taken. The first results of the terraces are in as well. Plants grow faster and bigger, the weeds are different too, more delicate and less spiky than on land we did not terrace yet. The same terrace, about 5 weeks later. When the rains came back we made another observation: our irrigation water is different from rainwater! 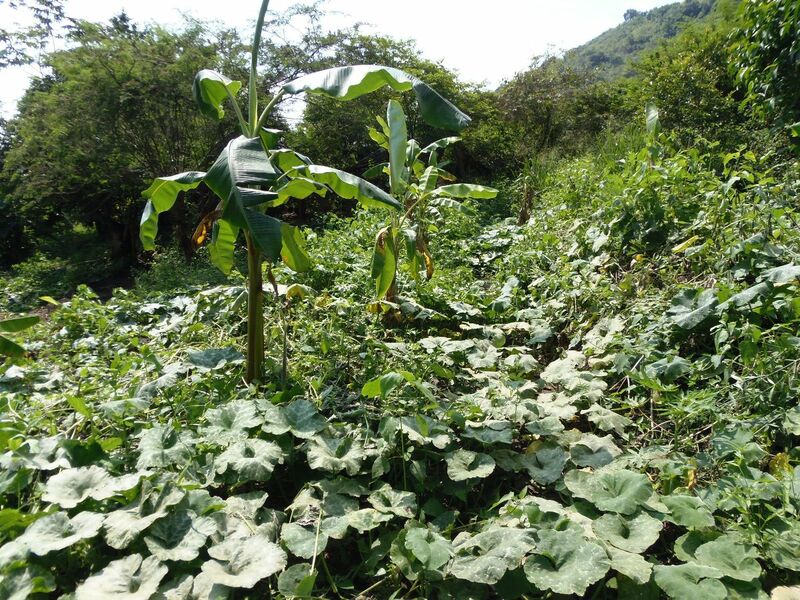 For months when we could still irrigate we wondered why for example sugarcane and cacao would grow, while our coffee and other plants survived without growing at all. When our rainy season was a couple of months going, during the last quarter of 2016, the plants and baby trees that just survived without growth picked up and grew again. This was an observation too obvious to ignore. When I found an old little bottle of a pH tester for fish water I wanted to see if maybe there was an explanation there. I tested the water in all dams and the water of a little spring we had running for a few weeks and all tests came back the same: pH of 7.6 or higher (the test has an upper bound of 7.6, so it could also be 8). Our soils are obviously alkaline and that creates alkaline irrigation water in our dams too! Checking the list of species we tried for their preferred pH range confirmed this finding. Everything that grows well here are plants that tolerate alkaline soils. What failed were all plants that like more neutral to acidic soils. Called a bread-tree here, could be a jack fruit or related. Did not grow when irrigated with alkaline water, has taken off now the rains are back. We did not only observe plant life, there are animals here too. In our two key point dams we had a few dozen water turtles. We seriously worried about their survival. But they did, the picture below was taken after the drought ended and our dams slowly started to fill again. The little bit of water (about 10 cm) left in our big dam during the final dry months may have helped numerous creatures in our zone 5 survive as well. We do like to think it did, sometimes we found animal footprints there. When the rains came back the bird population, which was already rising steadily, more than doubled almost instantly. So did the number of insect species (which maybe explains the growing number of birds). 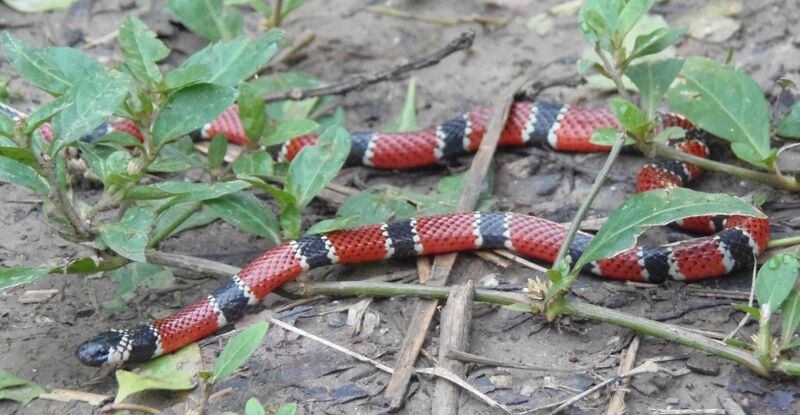 The number of lizards and frogs is climbing, we regularly see snakes again. We’re watching an absolutely fascinating increase of life on our land and after being here for less than three years only we get the feeling that we ain’t seen nothing yet!